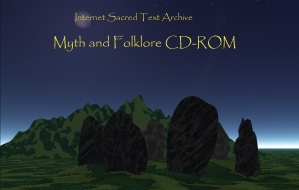 The Myth and Folklore CD-ROM 8.0 is a complete digital library of the mythology and folklore of all lands. We are now able to offer this magnificent collection for only $19.95 per copy. If you buy five or more, the price drops to 15.00 per copy. The content of the disk is up to date: it was mastered in December, 2008. This CD-ROM includes the same catalog system as the DVD-ROM; you can search by title, author and keyword. For a list of what is on the disk, refer to What's on the Myth and Folklore CD-ROM 8.0?. 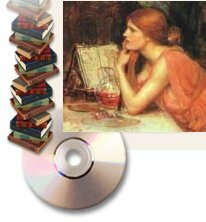 The Myth and Folklore CD-ROM 8.0 is a comprehensive library of world mythology, folklore and legends. This disk covers traditions from Africa, Native America, Oceania, Australia, Asia and Europe, as well as the mythology of Greece, Rome, the Ancient Near East, Ancient Egypt, and Celtic, English and Icelandic lore. Includes Homer, Virgil, Gibbon, Herodotus, the Eddas, the Kalevala, the Carmina Gadelica, the Pyramid Texts, and much more. Includes 600 complete books. Ideal for schools, libraries and students. REQUIREMENTS: A PC or Macintosh with a CD-ROM drive and a standard Web browser. The CD-ROM does not require a DVD-ROM capable drive, so it will run on very basic or older computers. If you are on a budget or simply want the best resource ever for the study of mythology and folklore on one easy-to-use CD-ROM, the Myth and Folklore CD-ROM 8.0 is a must buy!